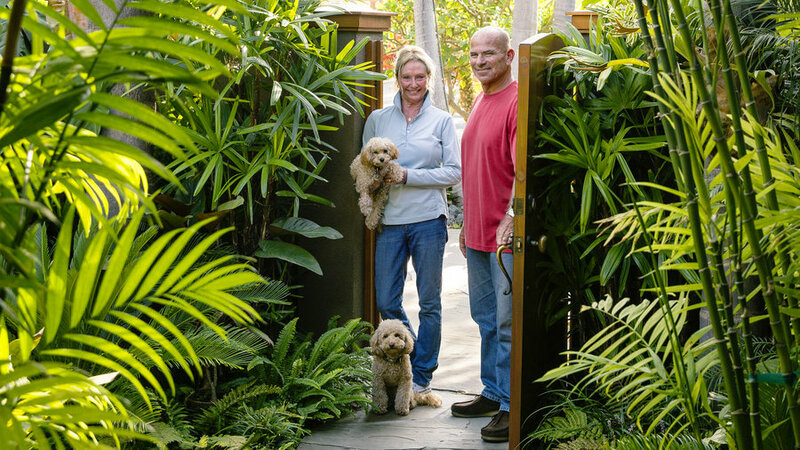 In the '90s, Jack Rice took a business trip to Kauai with his wife, Kathy. Almost as soon as their plane touched down, the couple fell wildly in love with the Islands. Over the next few years, the couple frequently returned to Hawaii with their sons, John and Matt, ultimately visiting all the major Islands. Kathy took up hula dancing; Jack fantasized about buying a place there. 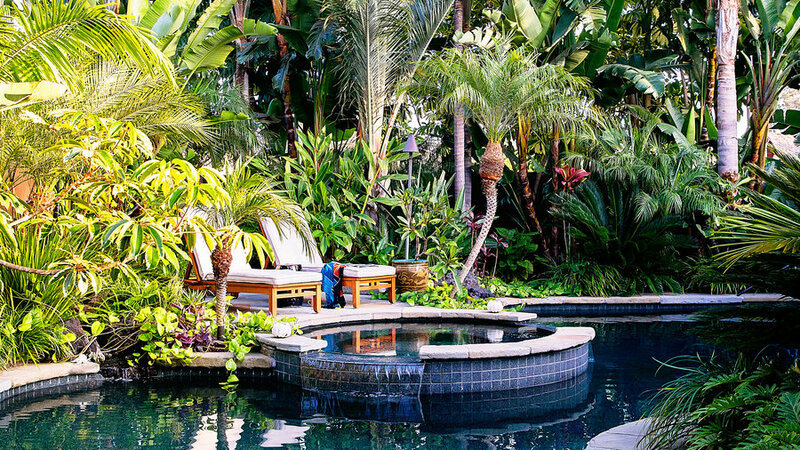 “I love plants, and envisioned dragging a hose around my garden in Hawaii,” he says. But their sons (now grown) wanted to stay in California. The lush makeover, amazingly, didn’t result in a bloated water bill. 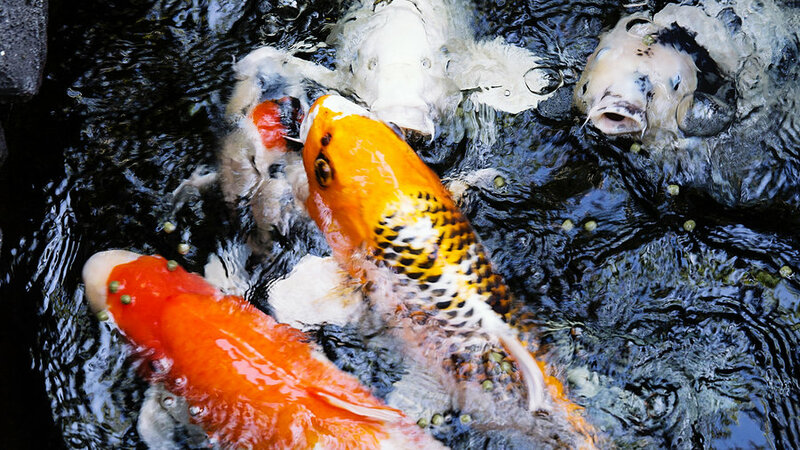 “With the pool and koi pond, plus all the vegetation, it was apparent early on that we had to manage our water wisely,” says Jack. Thanks to a drip system with a moisture sensor and carefully calibrated watering schedules, the garden actually requires less water than the lawn it replaced. Design: Brian Ackerman, Land Arch; . 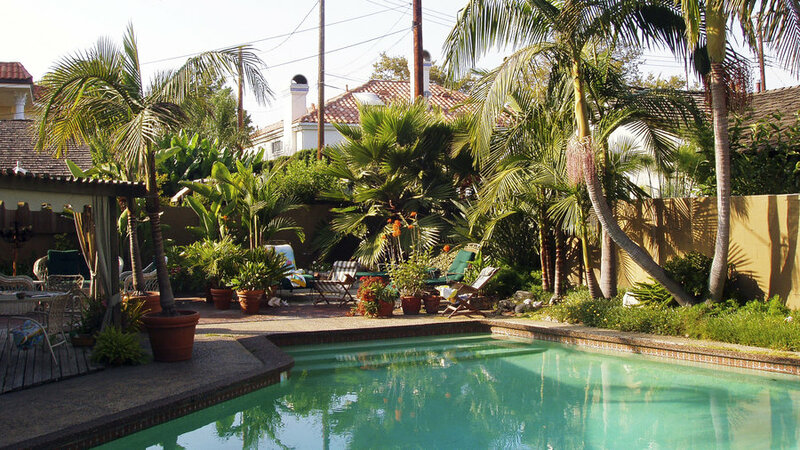 Before the lush makeover, an angular 1950s swimming pool dominated the backyard, with tiny patios crowded around its edges. 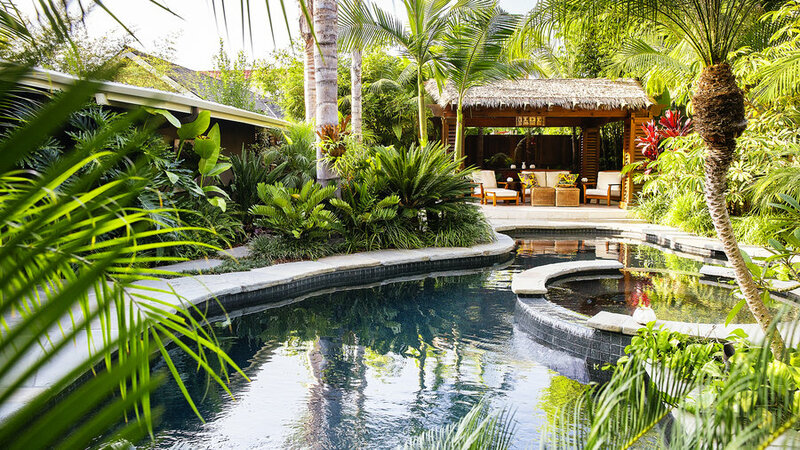 The shapely pool and Hawaiian-style pavilion make the space seem roomier, while palms and other greenery create privacy and add island ambience to the backyard design. The lagoon pool has 10-foot-wide “wade-in” steps, a spa with adjacent lounge island, anda deep end for swimming. An interior finish (Pebble Sheen in Ocean Blue, from Pebble Technology International; ) gives the water its color and shimmer—“like iridescent abalone,” says the garden’s designer. 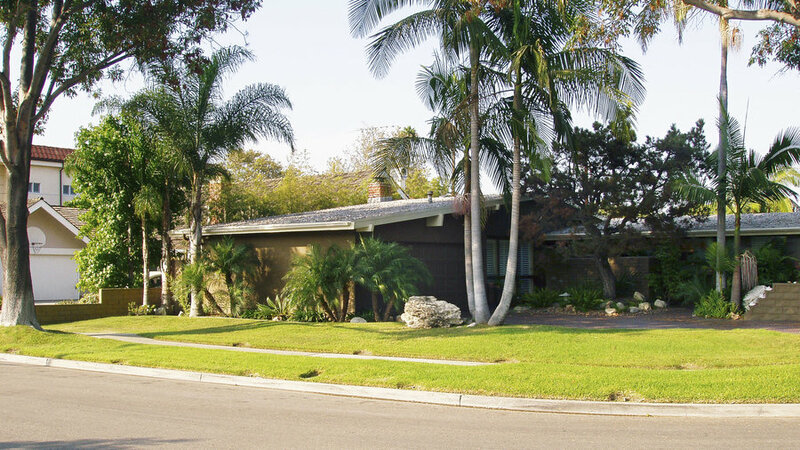 The front yard was mostly lawn, dotted with junipers, palms, and a pepper tree. The corner lot offered little privacy from the street. 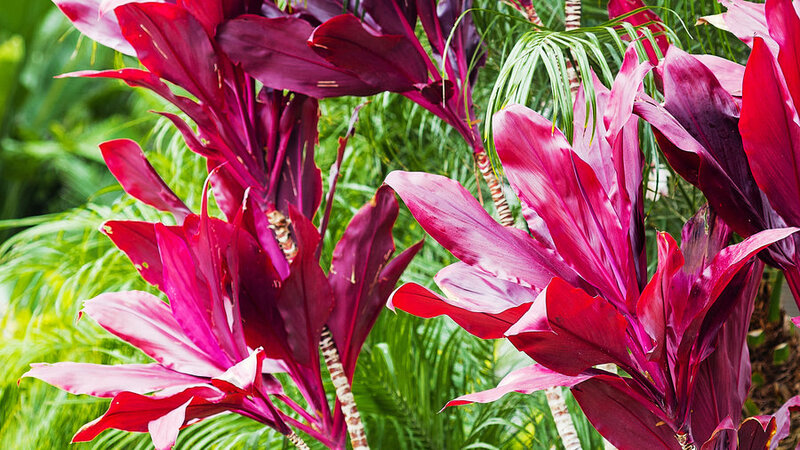 Bromeliads, cycads,plumerias, and red ti plants form a verdant tapestry beneath tall palms, yet plantings use less water than the replaced lawn. 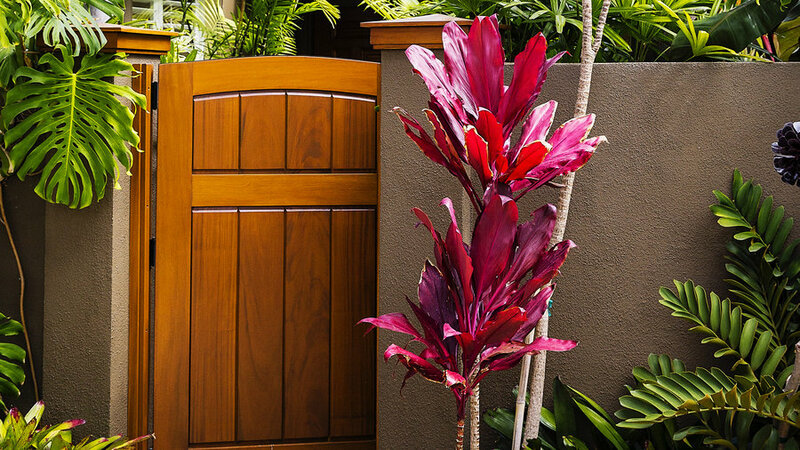 The custom gate is stained to match the pool pavilion. The wooden caps topping the pillars on either side are removeable if repainting the stucco is needed. "This entry sets the tone for the whole garden," says Jack Rice. 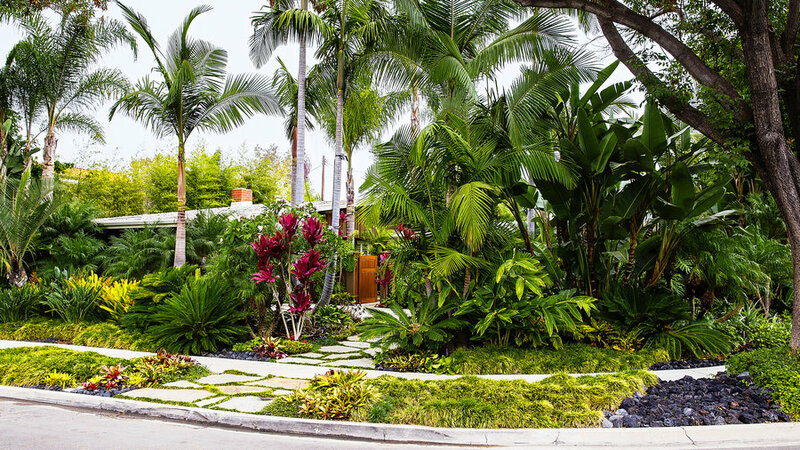 Throughout the garden, king, queen, and pygmy date palms tower above cycads, plumerias, variegated schefflera, yellow gingers, red ti plants, and bromeliads that include the showy Billbergia pyramidalis. 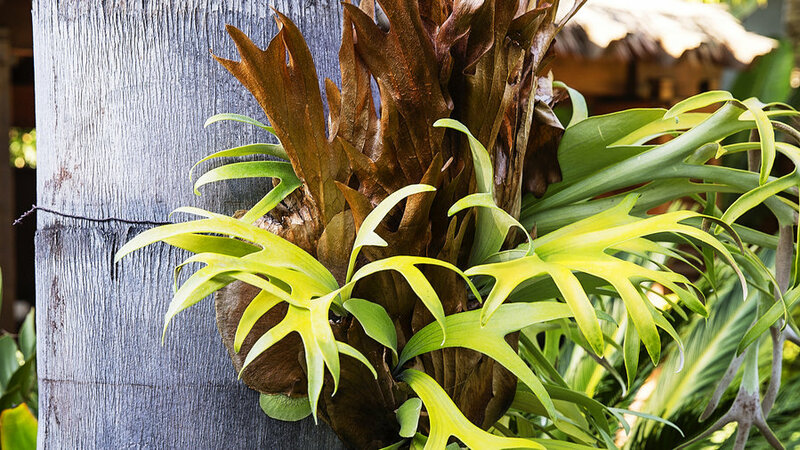 To fill in, Jack moved some houseplants outdoors, such as a staghorn fern that he mounted to a palm beside the pool. 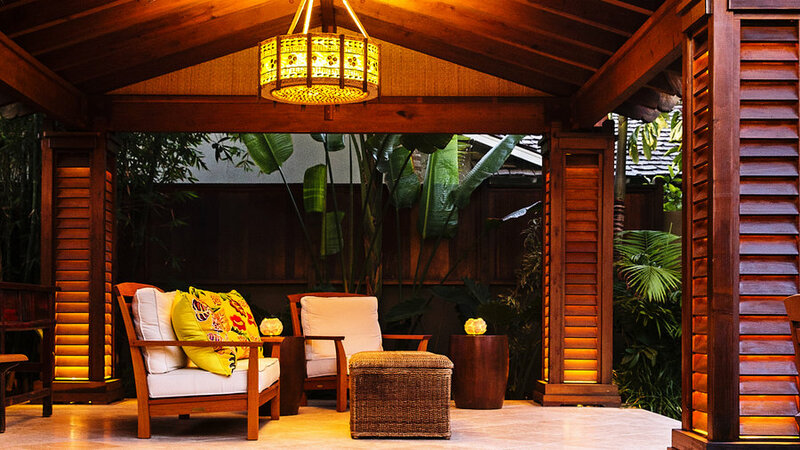 Designed by Ackerman of mostly clear heart redwood with louvered pillars, the pavilion is stained to match the gates (Sikkins Cetol Log & Siding in Natural Oak) and has a simulated palm thatched roof of fireproof fiberglass. “You could smoke a cigar in a hurricane out there and not set the roof on fire,” says Ackerman. Travertine tile covers the floor. 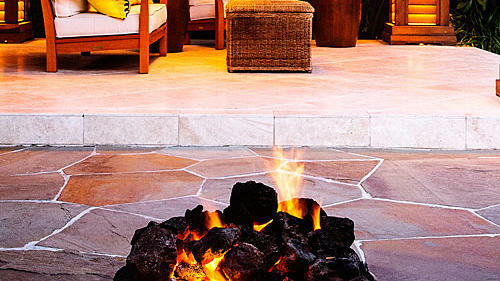 Piled high with lava rock, the gas-fed firepit recalls an ​active Big Island volcano in miniature. Just 2 feet deep and 2 feet square, the firepit is located between the outdoor pavilion and the house, so the Rices can enjoy it from both places. 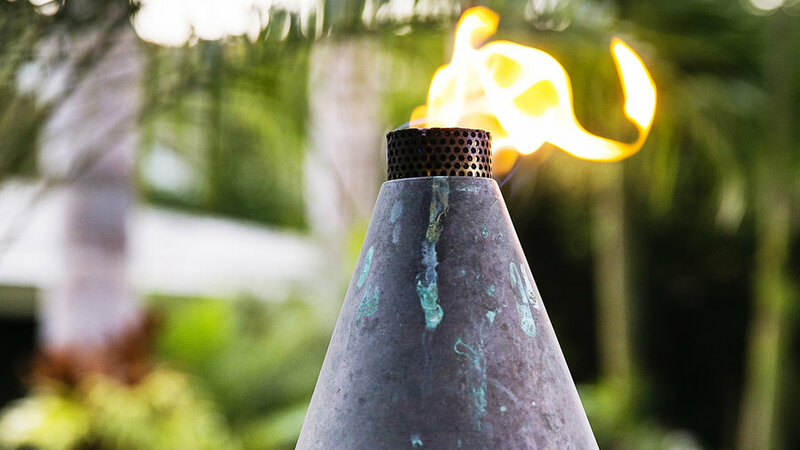 To enhance the nighttime drama beside the pool, the Rices light up their traditional, island- style tlki torches. 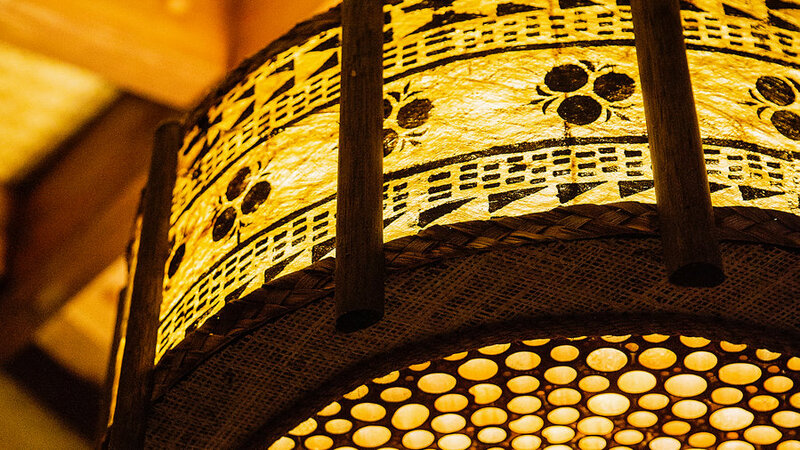 As with the gas-fed tikis used in Hawaiian hotels, these have cone-shaped copper heads, brass internal fittings, and perforated stainless diffusers surrounding the burner. Find similar ones at Beachside Lighting Hawaii (). From coastal Mexico, this plant has fronds of extremely stiff leaflets, which grow from short (sometimes subterranean) stems. The plant reaches 3 feet tall and to 6 feet wide, and does best in a spot that gets full sun or part shade, and regular water. Sunset climate zones 21-24, H1-H2 . As a youngster, this primative, cone-bearing natives of Japan has an airy, fernlike appearance. 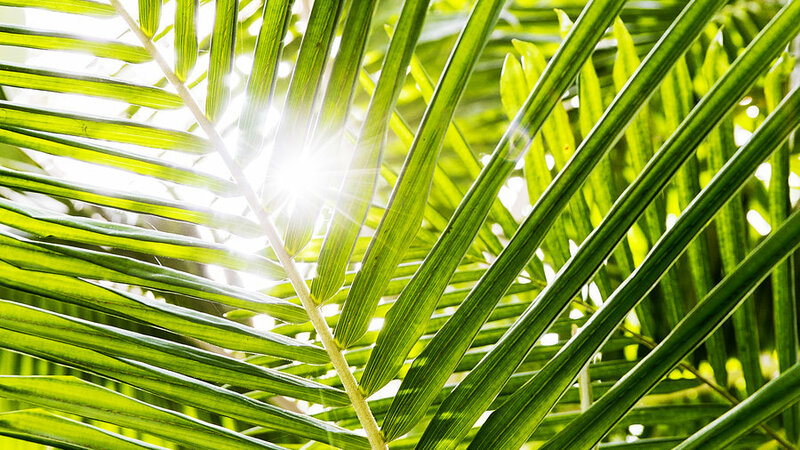 But with age (it grows slowly to 10 ft. tall), it looks more like a palm. Stiff leaves reach 2- to 3-ft. long (larger on very old plants). 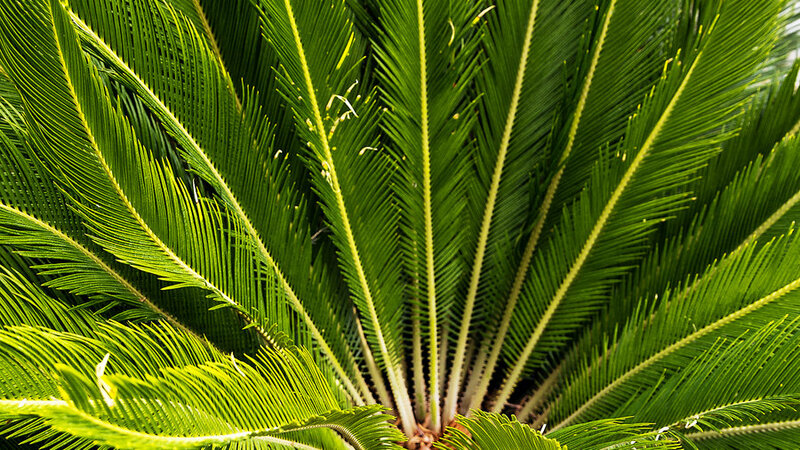 Sago palms are tough and easy to grow, even in large containers. Sunset climate zones 8-24; H1, H2. 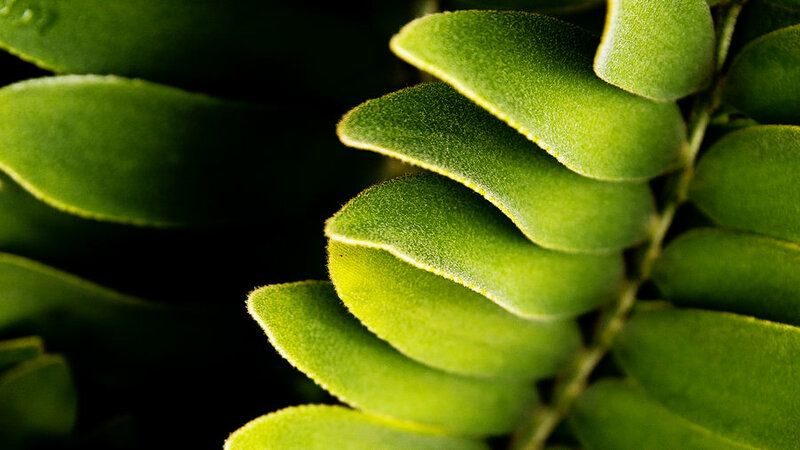 In the wilds of Australia and New Zealand, these ferns grow on trees, so why not mount them on slabs of bark to hang on a wall, or on palm trunks as Jack Rice does? Rice bought his staghorn years ago for $11. "I broke it into smaller pieces, put sphagnum moss behind, then attached the pieces to the palm trunks with baling wire," he says. Give them part shade, and water them thoroughly but not often (only when dry). Sunset climate zones 15-17, 19-24; H2. These beautiful deciduous trees, which Hawaiians call Pua Melia, are actually native from Mexico to Panama. 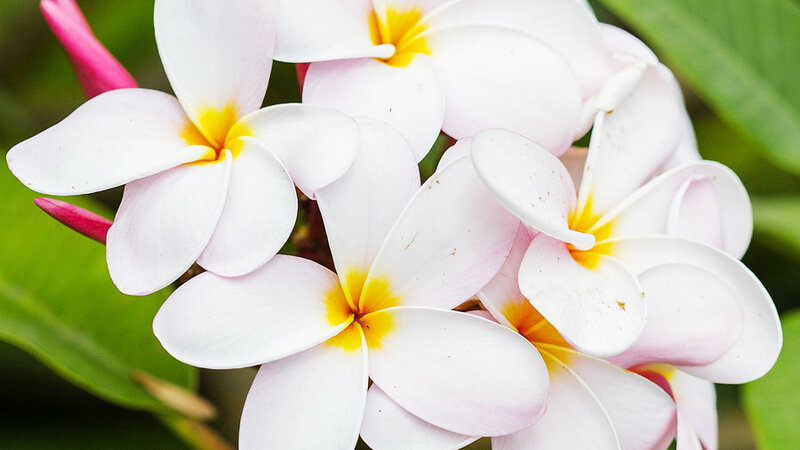 But their deliciously fragrant flowers, which bloom in clusters in summer, are used to make leis in the islands. Most plumerias grow at a moderate rate to 35 ft.. tall, but newer miniature types are gaining popularity. Give them full sun, fast-draining soil, moderate water. Sunset climate zones 12, 13, 19, 21-24; H1, H2. Leaves in many colors, from red and pink to varietaged, cluster like feather dusters at the tops of skinny canes. Often grown as houseplants, they can grow 6 to 15 ft. tall outdoors in frost free locations where winters are warm. In Jack Rice's garden, they make gorgeous accents beside the front gate and in poolside borders. Give them full sun to part shade, and moderate water. Sunset climate zones 21-24, H1, H2. 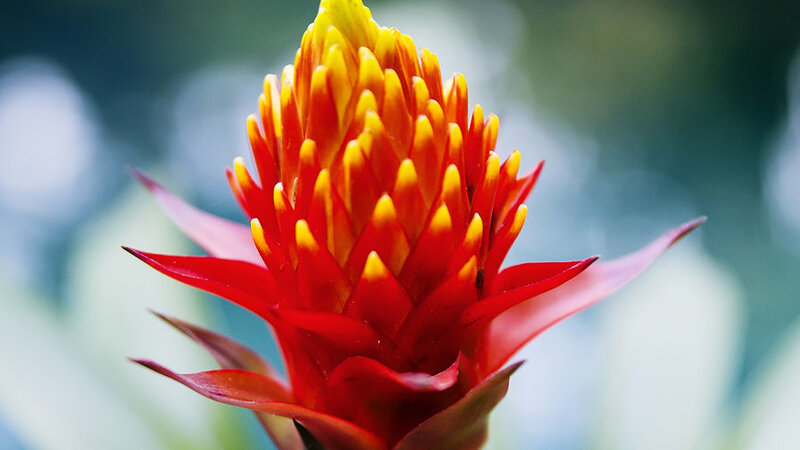 This bromeliad, native to the Atlantic coast of Brazil, grows up to 4 feet tall and 3 feet wide; its red and yellow flower spikes can grow up to seven feet tall. The plant needs soil with good drainage. Give it sun near the coast, part shade further inland. Sunset climate zones 22-24. 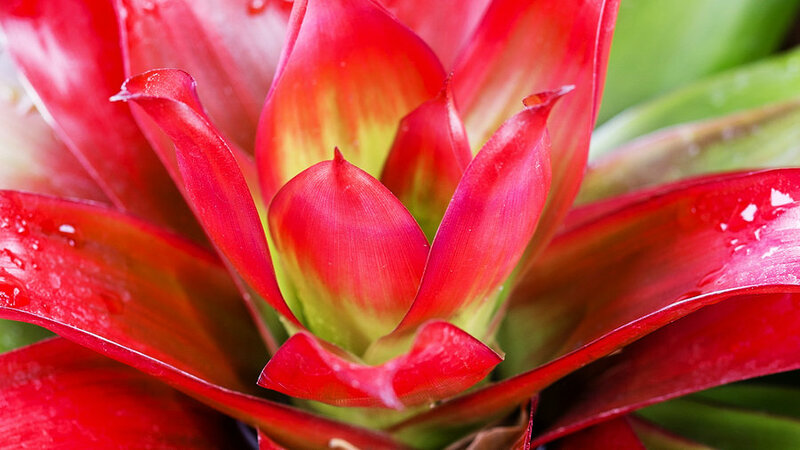 These bromeliads, native to South American rainforests where they grow in trees, have mostly flat stout leaves, sometimes with banding or stripes, and a shallow center cup which both holds water and sends up flower spikes. They need humidity and filtered shade; to irrigate, just pour water in the central cup. Sunset climate zones 21-24 or in pots indoors. 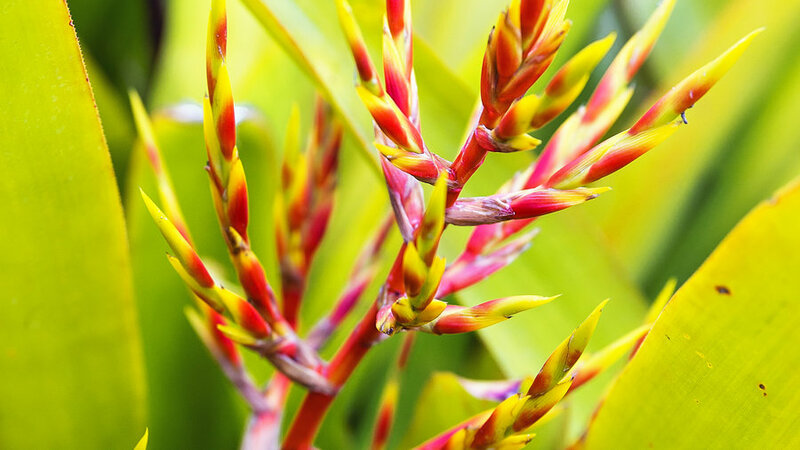 Striking blooms come up from the centers of these Brazilian natives in late summer, and they glow like torches. In the ground, the plants quickly form large clumps; at the base of a tree, they'll even start to climb the trunk. Give them light shade. Sunset climate zones 12,13, 16-24.